The Korean Ministry of Science and ICT (Minister You Young-min) held the “Meeting for the Project to Foster Youth TLOs,” which is being pursued for the expanded employment of young scientists and technology talents. The said meeting was held on April 24 (Tuesday) at the Grand Meeting Room on the third floor of the Seoul National University of Science and Technology’s (SeoulTech) Administration Building. ▲ President Kim Jongho of SeoulTech, Director-General Lee Chang-yun of the Office for Policies to Utilize Research Achievements of the Korean Ministry of Science and ICT, and other leaders of industry–university cooperation teams of universities based in Seoul and Gyeonggi-do Province, participated in the meeting among others. The “Project to Foster Youth TLO” is a new paradigm for job creation for the youth wherein public technology owned by universities are transferred to the private sector. It is a pilot project that the ministry is pursuing to create jobs. TLO refers to “an organization exclusively working on technology transfer” and is used to refer to organizations that make a profit by selling patented technologies owned by universities or research centers to companies. 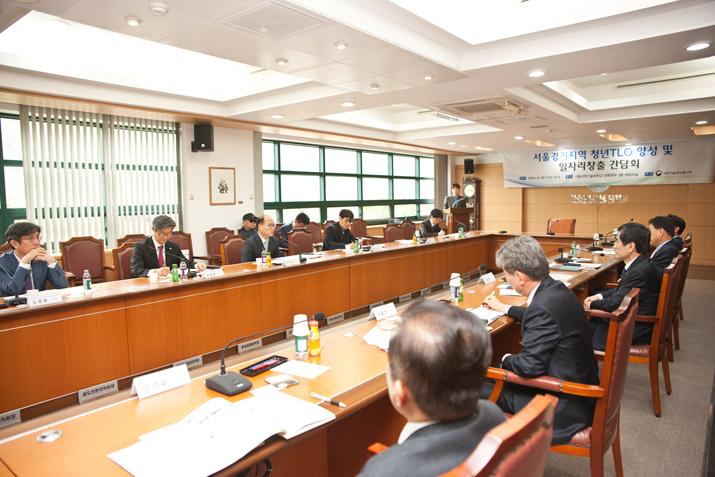 Leaders of industry–university cooperation teams and working-level officers from a total of 10 universities—Kyung Hee University, Korea University, Dankook University, Myongji University, Ajou University, Yonsei University, Eulji University, Inha University, Chung-Ang University, and SeoulTech—participated in the meeting. During the meeting, the participants discussed measures for cooperation between companies and universities based in Seoul and Gyeonggi-do Province, and job creation for engineering and science graduates who haven’t found jobs yet.